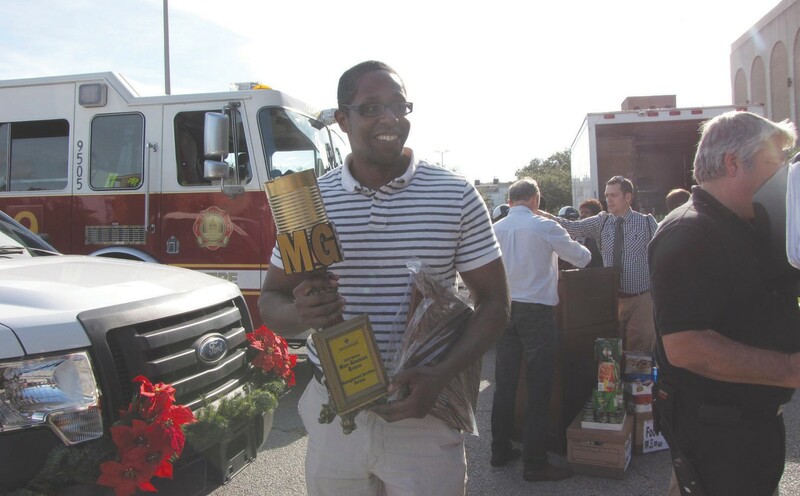 City of Savannah employees today stepped up in a big way to help those in need this holiday season, donating 23,349 canned goods to America’s Second Harvest of Coastal Georgia during the 2nd annual Great Savannah Canned Food Drive. Dozens of City vehicles packed full with cans lined up in front of the Civic Center this afternoon for a news conference attended by City employees, Mayor Edna Jackson and members of City Council. 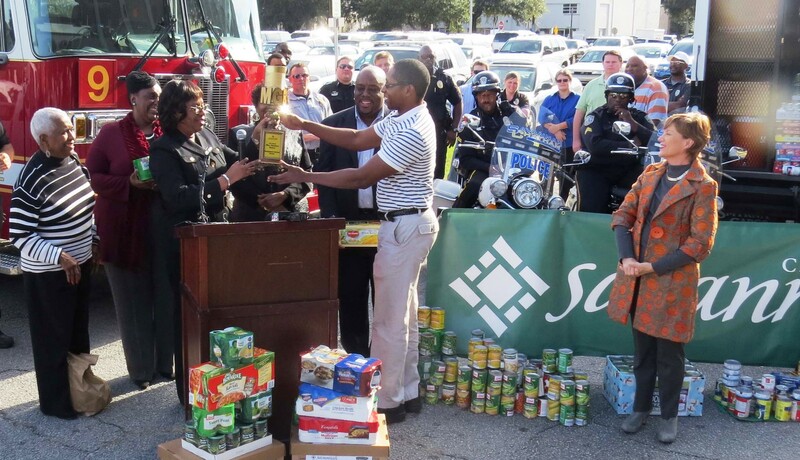 At the news conference, City Manager Stephanie Cutter presented the Most Generous Bureau Trophy to the Management Services Bureau, whose 240 employees donated 3,600 cans, or about 15 cans per employee. Management Services, headed by Bureau Chief Sean Brandon, includes the departments of Human Resources, Mobility and Parking Services, Recorder’s Court, Research and Budget, Vehicle Maintenance, Revenue, Purchasing, Research Library and Information Technology. The Most Generous Bureau Trophy presented to the Management Services Bureau, headed by Bureau Chief Sean Brandon. Following the news conference, the City vehicles caravaned to America’s Second Harvest Food Bank. The 30 pallets will be enough for an estimated 36,981 meals this holiday season. America’s Second Harvest of Coastal Georgia serves as a regional food bank, functioning as the food warehouse and distribution center to more than 280 non-profit organizations and churches in our area. Through food relief programs and collaboration with partner agencies, America’s Second Harvest distributed more than 10 million pounds of food last year to people in need in our community – children, senior citizens, people with disabilities, people experiencing homelessness and others whose incomes are insufficient to meet their basic needs. To learn more about the fight against hunger in our community, call (912) 236- 6750 or visit www.helpendhunger.org.